This acceptable use policy sets out the terms between you and us under which you may access our website www.elywebsolutions.com (our site). This acceptable use policy applies to all users of, and visitors to, our site. Your use of our site means that you accept, and agree to abide by, all the policies in this acceptable use policy, which supplement our terms of website use. www.elywebsolutions.com is a site operated by Gillett Multi Marketing (we or us). If you have any questions regarding the acceptable user policy of Ely Websolutions then you may contact us using the contact information given below. On this website you will find everything you need to know about what we do, how we do it, and what we charge. And if you are ready to talk to us about what Ely Web Solutions can do for you, please contact us by using our Contact Form (recommended), or telephone on 01223 926187. A representative will be happy to answer all of your questions and, if you require, arrange a meeting at a time of your convenience. This initial consultation is completely free and without obligation. Ely Website Design: Ely Web Solutions offer a large range of web design options starting with our keenly priced 'Webvert' one page web site design that gives you a web presence for £125.00 per year to fully tailored web site designs based on your own budget. Ely Web Hosting: Our Ely web hosting plans are designed to be competitive for the Ely area. Ely Web Solutions web hosting facilities start from our email only account up to larger business web hosting solutions. The email only web hosting account is ideal for the small business that currently does not have any web presence and uses a free email address like myshop@hotmail.com. 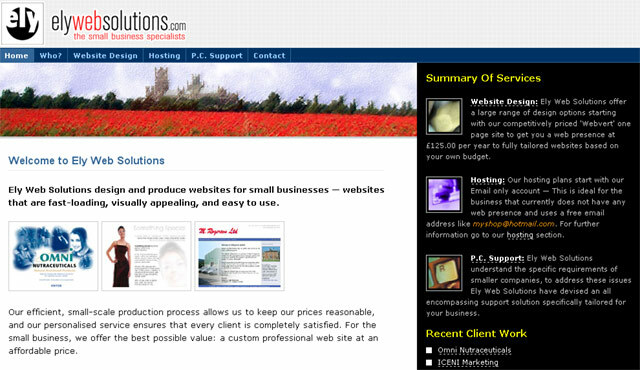 For further information go to our Ely web hosting section. Ely P.C. Support: Ely Web Solutions understand the specific requirements of smaller companies, to address these issues Ely Web Solutions have devised P.C. computer support and P.C. computer repair solutions specifically tailored for your business. For full details of our repair and support options please visit our Computer repairs and support section. Note: The pages of Ely Web Solutions rely heavily on CSS (Cascading Style Sheets) for many visual design details. This browser may not support CSS adequately enough, stylesheets may be disabled or blocked, or necessary files may not be loading correctly. Our pages can look beautiful in the right browser!